You are less than a quarter of a mile into the Portsmouth Coastline Marathon when you run straight into a lamp post that you are sure wasn’t there last year. With blood streaming down your face, you decide to carry on. b) Stupid, reckless, foolhardy, self-centred and mad? My wife – four days later – has just managed all of b) in the one sentence, highlighting the truth of that old thing about men being from Venus and women from Mars (unless it was the other way round). My week’s great debate has split the men from the women as surely as it has split the marathon-runners from the non-marathon-runners. A guardedly-disapproving maternal “You’d already proved you can run a marathon” seemed to me to be missing the point. This was definitely new territory. I hadn’t actually proven I could run one with a broken nose and a gashed forehead needing five stitches. Nor had I shown I could run one with concussion, that bizarre, disorientating sense of the route coming up to meet you and then doubling back to trip you up. In my mind, I was joining – as a very junior trainee associate member – that great club which surely boasts the great Bert “What broken neck? I’ve got an FA Cup final to play in!” Trautmann as its life president. At the very least, my little lamp post altercation lifted what would have been a so-so marathon for me into the ranks of something outrageously worthwhile. If there was an immovable object on the route, then I am honoured that it fell to me to attempt to be the unstoppable force. The last five miles were dizzyingly awful, which meant a disgraceful amount of walking, which meant a finishing time 12 seconds inside four hours. Without the bump, I would probably have run 3 hours 45 minutes, which would have been a fairly forgettable time on a genuinely-different, challenging and enjoyable course. At least now, I have got the stuff of my own little running legend. I’d like a blue plaque on that lamp post (to replace the red splat) because maybe, just maybe it will prove another turning point in my running career. My last four or five marathons really haven’t been terribly enjoyable, on the basis that a marathon will always throw up something to knock you off your stride, and I was starting to think that the great god Marathon was trying to tell me it was time to pack it all in. But it took running into a lamp post to knock some sense into me. I don’t want a difficult marathon to be my last marathon. I want to bow out on a good one, which means that I probably won’t bow out at all. If I do ever again actually manage a good one, I know it won’t be long before I decide that it’s not good enough. To do a decent marathon, you need so many different factors coming together in your favour that inevitably it’s just a matter of minutes before you start to think that things were just so massively stacked in your advantage that you really didn’t exploit them enough. That’s the nature of marathons. A little bit like picking at a scab, perhaps. Pick and you will want to pick some more. Or maybe I should say like picking at your stitches, which are currently driving me nuts. Thank goodness they are coming out tomorrow. In the meantime, it’s a lovely thought that in Portsmouth, there’s a lamp post that will always be Phil. It’s a little like a modern Cinderella. I wonder if Portsmouth City Council will now scour the land in search of a runner with a profile which fits the dent in their lamp post. b) stupid, reckless, foolhardy, self-centred and mad. Every author’s dream is to be recognised. It’s just what happened next that was the problem. But the massive consolation is that it’s surely one of the funniest things ever on a marathon course. I glanced to my left to say yes and ran straight into a lamp post. My swelling pride lasted just about a nanosecond before the awful, clanging impact sent me reeling backwards. I felt terrible – terrible for repaying my fellow runner’s friendliness by the disconcerting spectacle of me head-banging a piece of street furniture. Just a shame it wasn’t a settee or something rather softer. For several seconds, I couldn’t think straight, but then came the gush of blood – and boy, did it bleed in the way that head wounds usually do. It was like turning on a tap. But fortunately, help was at hand. The poor chap – known in the twittersphere as #gearselected – was solicitousness itself as he persuaded the occupants of a parked car nearby to part with a wadge of tissues which I duly drenched. It took me back to that moment five minutes into the New York City Marathon when a chap tripped and crashed down onto his knee. It was obvious he was out of the race, and you just knew what everyone else was thinking: that could have been me. I staggered on. When you’ve written a book called Keep On Running, not continuing wasn’t an option, and maybe I ran on shock for a while before the impact properly hit me. At four miles, thinking of the miles stretching ahead, I was within a whisker of pulling out. But that’s when that old cliché about marathon-running rescued me. The only person you run against is yourself. Everyone else you are running with. And what a superb bunch they were. I lost count of the number of people who checked I was OK. I wish I had a mince pie for every runner who said “You’re going to need stitches in that, mate.” I had the distinct advantage of not being able to see what I looked like. Their generosity of spirit kept me on track. In my confused mind, I was Terry Butcher playing on in that vital World Cup qualifier in Sweden, blood dripping down his shirt. But you don’t bash your head like that without paying a price. At about 20 miles, as we came back alongside the eastern road, I started to lose a sense of height and depth. It became difficult to judge differing levels, and the short drop to the beach to my left was giddying in a worrying way. I wasn’t at all sure I was seeing it properly. My only option was to walk. And that’s when yet another runner spoke to me: “We’re all keeping an eye on you, mate,” he said. And so they did. Just before South Parade Pier, with barely half a mile to go, with a head that felt like every single Christmas carol that has ever been written was being played in it, I was inches away from the absurdity of packing it all in. I was conscious I wasn’t running straight, and my head hurt like hell. I hope these words reach runner 660. He told me he would get me over the line and he did, by which time someone else had warned the paramedics that I was coming. They were waiting for me, and the care was terrific – even if the wait at the minor injuries unit at St Mary’s Hospital wasn’t much short of the time it had taken me to run the marathon. The upshot was five stitches to my forehead, lots of questions about what day it was, who was the prime minister, lights shining in my eyes, high-blood pressure, slow pupils, concussion and very likely a broken nose. Apparently they don’t X-ray noses. This morning, it’s roughly the shape of the dome of St Paul’s Cathedral. Oh, and two eyes that are turning black. It’s been a groggy, thuddingly-painful, sleep-free night, but looking back at yesterday, I wouldn’t have missed it for the world. I love marathons, but more and more I am realising that it is one’s fellow marathoners that make marathons the insanely-seductive events they are. And I think I have just discovered the very best pain-killer there is: the kindness of runners. It’s the story of my 25-plus marathons around the world – a tale of trying your hardest, “screwing your courage to the sticking place” as Lady Macbeth so delicately puts it, and pushing on. It’s the story of motivation and a bit of madness, pursuing a goal, occasionally getting there and often coming a cropper. As such, it’s a highly-personal tale – a bit self-obsessed, a little bit in my own bubble. And as such, I must admit I was a bit nervous when it first came out. After all, we’d all rather remain ignorant of someone’s opinion than know that they don’t like you or your work, wouldn’t we? Well, I would. But it’s been a fantastic journey in itself since “pub day”, as my publishers so quaintly call it – the day the book hit the streets in the way that I have been hitting them for years. A fantastic journey because the response has been so overwhelmingly positive. Well, apart from the snotty runner who told me I couldn’t possibly consider myself addicted to marathons unless I’d run a couple of hundred. The great news is that his snarliness has been the exception. The lovely thing is that people seem to have tapped into what I was hoping to get across – namely that running, however much it hurts, however much it occasionally disappoints, is simply the most gobsmackingly, joyously liberating thing open to man. It hardly matters that the vast majority of us aren’t exactly knocking on the door of Olympic qualification. What matters far more is the pleasure that we get out of going for a run – the pleasure that keeps us coming back. Even if a marathon goes wrong, then we’ll be back to put things right. If a marathon goes well, equally we’ll be back for more in the hope of making good even better. Addicted? Well, yes. But addicted to something which brings happiness; something which relieves stress far more than it ever creates it; something which makes us all much more balanced, rounded people. Do you spend your day fighting off hundreds of emails? Trying to fight back the tidal wave of work which seems forever on the point of washing you away? Go for a run, and you’ve reclaimed your you time; you’re human again; stretch yourself, and you might even believe you’re superhuman. Which is why I am so chuffed at the response I have got. hi phil, just wanted to say that it thought your book was great, really enjoyed it. Already halfway through @marathon_addict book. Compiling a list of marathons, even more gutted to have missed out in the NYC ballot. @marathon_addict I’m currently reading your book and it could me, except 35 when I started running. 2 halfs so far. Great read. @marathon_addict Reading your book 🙂 Really enjoying it!! With my first marathon coming up in 2 weeks time (the London Marathon 2012) I had this book on pre-order when I saw it was coming out, hoping it would bring me inspiration! I’ve just finished reading it today and I think it is a great read for all marathon runners and aspiring marathon runners! I really enjoyed reading about the ups and downs of Phil Hewitt’s 23 marathons around the world. 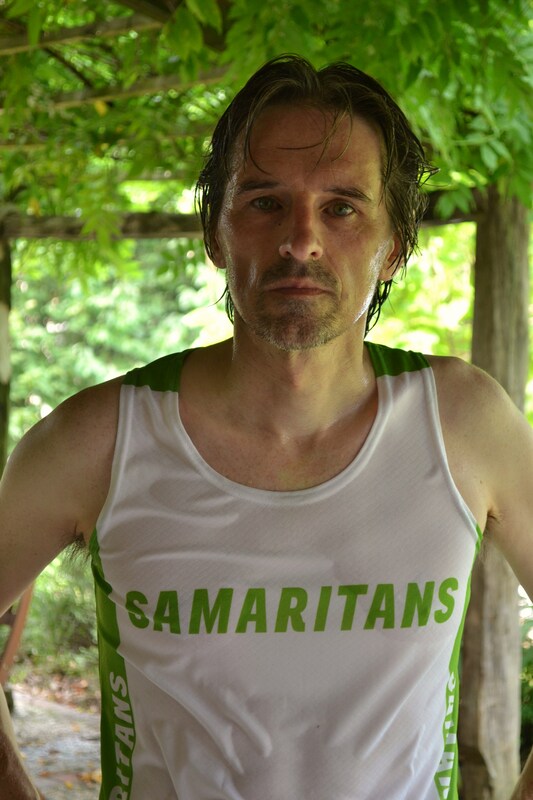 He talks frankly about his awful marathons and inspirationally about his great ones. He really gives an insight into what can be experienced over 26.2 miles and before and after a marathon. There are some photographs on the inside front and back covers (8 in total) and I would have liked to have seen more, but it’s not a big issue. He has been to a number of big city marathons but he’s also done more unusual and smaller marathons which are really interesting to read about. It’s an easy and enjoyable read that I’m sure would appeal to all runners. 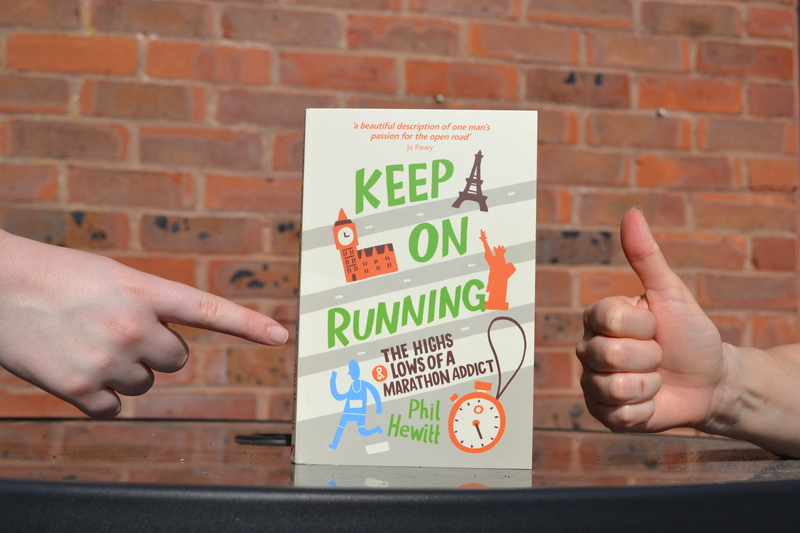 If you’re not already signed up to run a marathon then this book will make you want to, even after reading about Phil’s worst experiences! Highly recommended! This book is brilliant. I have never reviewed anything on Amazon before but felt this book was worth it. It will make you want to enter a marathon today. If you have one on the horizon, as I do (VLM 2012), then it will raise your excitement levels sky high. Ah yes, runners are wonderful people. Mwah! Mwah! I love you all! It’s here! It’s arrived! I’ve got it in my hands! I have become an author, with a new book just ready and waiting to hit the world on April 2 (kind of glad, it’s not the day before). But best of all, my publishers Summersdale have done an absolutely superb job of it. I know you shouldn’t judge a book by its cover, but I’m going to make an exception for this one – partly because I have read it so many times I am not quite ready to read it again yet. Keep On Running http://www.summersdale.com/book/2/569/keep-on-running/, the story of my love of marathon-running and all the pain and pleasure it has brought me, looks and feels great. The little package was waiting for me when I got back from work on Friday; I knew what it was from the postmark; I opened it with a little trepidation, just wondering what that crucial first impression (by which we judge everything these days) was going to be. Out the book tumbled – and what a relief. I loved it. A relief indeed because I had never been totally convinced by the cover. But I am now. Leaving aside the words inside, it looks terrific – a complete vindication of the design that Summersdale came up with. The cover – and I love the colour scheme – sums up precisely the kind of semi-serious, funny and upbeat book I was intending. If I saw it on a shelf, I’d definitely want to read it (and I can say that because the look is Summersdale’s, not mine). With publication day – or “pub day” as Summersdale far more suggestively call it – just a couple of weeks away, I feel I am entering the home straight in the best possible hands, the final few miles of a journey which began several years ago. I was convinced I was a gruesome-crime writer and had chatted to the lovely Peter Lovesey about a very gruesome murder mystery I’d written which languishes still unpublished. Peter, for some years now a Chichester resident, is the creator of the terrific Peter Diamond Bath detective series (http://peterlovesey.com/), and he gave me every encouragement in my own efforts . But more importantly he suggested I write about the marathons I was regularly running – a suggestion which initially didn’t appeal. Or rather, a suggestion which needed to take root first. It lodged in the back of my mind, and it was a couple of years later that I was ready to do the deed. It was October 2010; I was on the plane on the way back from the Mallorca Marathon, and Peter’s idea just wouldn’t leave me alone. The flight passed in a flash. By the time we touched down, the book was written in my mind. A couple of weeks later, it was ready on the computer. I approached Summersdale Publishers in Chichester (the city where I work), and they were instantly encouraging and quickly agreed to take on the project. But Jennifer, my first editor there, broke it to me gently that the book wasn’t there yet. I had written five ways to lash up a marathon, followed by five ways to get it right. It was funny, she said, but the disasters would see the readers dropping by the roadside before they ever reached the successes. Jennifer encouraged a chronological approach, and that was the moment the book clicked. Abbie then took on the editing – and proved a godsend. She’s got the loveliest, sweetest, most encouraging personality, but behind it is the surest of instincts, and I knew from the start that whatever she suggested I could trust in implicitly. Not too many people are allowed to point out where it’s my anorak, and not me, speaking – but Abbie did so, to the huge benefit of the book. Between them, Jennifer and Abbie urged me to tone down the endless stats. I hope the final product now feels more much human. And then it was over to copy-editor Ray, to whom my debt runs deep. The trouble with slipping in the odd idiocy is that you (or at least, I) don’t notice it. Ray does. Each and every one. No, kilometres don’t (and can’t) “inch up”; there’s a big difference between “mitigate” and “militate”; and you can’t say that Rome is “clearly polluted” given that pollution by definition is always going to be at least a bit murky. After that it was back to Abbie for the joint process of picking the photographs which now grace the inside of the front and back cover – again, an important element. Again, I hope that they stress this isn’t a pompous “how to do it” book. No, it’s a friendly, light-hearted look at the experience of marathon-running itself, how it feels, why we push ourselves, why we enjoy it even when we are hating it. So, as you can see, along the way, it’s all been a deliciously-collaborative process – not least in the help I have had from my fellow marathon-runner and father-in-law Michael who read the first drafts and firmly but very constructively pointed me away from many of the pitfalls I was falling into. This book is about marathon-running, but my hope is that it is marathon-running viewed from a very much wider perspective. Michael’s comments very helpfully pointed me in that direction. And so here we are then. My wife Fiona has very nearly finished reading the book, and believe me, it’s a strange experience to glance at the person lying in bed next to you and see them reading a book you have written. You lie there waiting for the laughs and suppressing all the “did you like that bit?” questions. And the good news is that she is loving it – even though she’s read it almost as many times as I have. I hadn’t realised that a book would involve the support and input of so many people; but, then again, anything that’s worth doing in life is inevitably something that brings people together. And in the preparation of Keep On Running, I have been blessed with the very best team possible. The A team. There are no mid-packers here. We are front-runners one and all, and I hope you will join us when the book comes out. Make a date with Keep On Running on April 2. April sees the launch of the marathon season, with big days coming up in London and Brighton, plus further afield in Paris Milan, Vienna and Madrid. From April onwards, there are dozens of marathons across Europe to enjoy. For those contemplating their first-ever attack on those fabled 26.2 miles, Phil Hewitt, author of Keep On Running, offers ten top tips to make sure you get the most out of your day. Familiarise yourself with the course. You don’t have to be heading out there into the great unknown. A little bit of research in advance can pay rich dividends. In New York, it was great to know that even when you reach Central Park, you’ve still got the best part of three miles to go. Lack of preparation had the opposite effect on my first London marathon. I thought I was home when I first saw Big Ben. Far from it. Three miles far from it, in fact. It was an awful moment – and so easily avoided. Get organised the day before. Don’t be afraid to be a bit anoraky. Make a list. Lay your kit out. Check it is all there. You absolutely don’t want to be fretting about the details come marathon morning. And for similar reasons, get to the start early. Don’t heap extra pressure on yourself by leaving it all to the last minute. Get there in good time and start to focus. Be early and mentally get yourself in the zone. Enjoy the start. Soak up the atmosphere. Chat to your fellow runners. There are countless tales to be told and stories to swap as you wait for the off – and they all can be part of your preparation. Marathon-runners are naturally friendly, chatty people. Make the most of that fact, and you will really start to feel that you are part of something special. Wallow in the camaraderie that will be there on the day. But keep warm as you wait. Take something along that you can discard a minute or two before the gun goes off. Once you’re running, generally the less you’re wearing the better; but you really don’t want to be starting off cold. Drink early and drink often. Your biggest enemy – in fact, your only enemy – out there on the course is dehydration. It is crucial to stay ahead of it. I always carry a bottle, especially in those early stages. Drink every three or four minutes. Remember if you start to feel thirsty, then it may already be too late. Don’t ever let yourself reach that point. It’s also a good idea to throw in a few strategically-placed sports gels. Remember, though, that these very often need to be washed down – otherwise they just sit on your stomach. They are quite thick and sticky, so a sip of gel followed by a sip of water and spin it out over half a mile, maybe three or four times during the race. But remember: if you’ve never used a gel before, a marathon is certainly not the place to try one out. Don’t set off too quickly. In my early marathons, I used to fret about the inevitable bunching you get at the start when 36,000 people simultaneously start running. But it really isn’t a cause for concern. Heavy-crowding can be your friend, reining you back when your first instinct might be to hare off. Do that, and you could well burn out way before the finish. Your best approach is to recognise that you are in it for the long run. You should therefore slip into that long run gently. 26.2 miles is a hell of a long way, so break it up in your mind to make it manageable. My own tactic is to find significance for every single mile number along the way. Mile one leaves a nice round 25; mile two is the first even number (yes, it can be as basic as that); mile six leaves a round 20; mile seven sees the remainder dip below 20 for the first time; and so on and so on. Or just count up in fives. But do something. Don’t ever think about the race distance in its entirety. That might just be a little off-putting! Be alive to your surroundings. Look for the landmarks, look forward to the landmarks, enjoy the crowd, interact with the crowd. Make sure you’ve got your name written clearly on your vest. As you tire, a great game to play is to decide which person in the crowd you are going to make shout out your name. Fix them, plead with your eyes and they will always respond. And it makes such a difference. Look forward to that moment of crossing the line. Focus on the feelings you will have, and those feelings will get your there. It’s like having your Oscar-acceptance speech at the ready. Focus on the elation that is coming your way. Nothing else will combine exhilaration and exhaustion in so magical a mix. Make sure you’re ready to savour your great moment of glory. Phil’s marathons include London, Amsterdam, Rome, Dublin, Mallorca, Brighton, Portsmouth Coastline, La Rochelle and Tokyo. Marathons need to offer you stimulation; they also need to offer you great support if you are going to last the course. Tokyo offered both in abundance last Sunday – a day which saw Tokyo take every single runner to its incredibly-generous heart. 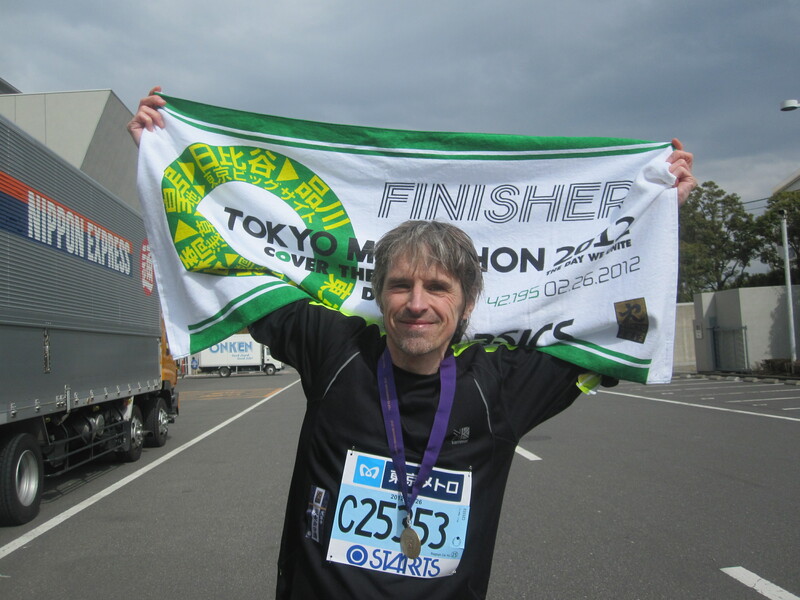 Tokyo was my 26th time running a 26.2-mile race, and I did it on February 26. The Japanese love number games like that, and it certainly felt like the stars were aligning in my favour. Within moments of arriving in the city, I knew that it was going to be right up there among the very best experiences a marathon can give you, rivalling Paris and New York for the sheer thrill of it all. But, as the dust settles, my abiding memory is going to be the sheer kindness of the people who lined the route and welcomed us home at the end of it all. As we collected our bags in the huge conference centre which serves as the race base and the race finish, every single one of the volunteers in the luggage retrieval area was standing there applauding us- when they weren’t scurrying off to find our bags with the maximum efficiency. Consider the fact that the finishers were finishing across a four-hour time span. That’s four hours that the volunteers stood there clapping. Their smiles never wavered. But nor were those smiles fixed. Those volunteers – and how lovely to see their faces – were enjoying our moment of triumph every bit as much as we were. And the great thing was that it was a moment typical of the entire day. The Japanese people really are extraordinarily giving. They smile all the time, and a smile counts for so much when you feel you are on your last legs. I lapped up that generosity over a last three miles in which I happily admit I seriously struggled. A 12-hour flight and a nine-hour time zone shift weren’t exactly the best preparation two days before. As I stood at that start line, my body was telling me that it was ten past midnight. And I stood there shivering. Just three days later, Tokyo was blanketed in snow. On marathon morning, it was already perishingly cold. Thank heavens for all the warmth that was to follow. Warmth from the crowd, that is. They applauded, they shouted, they willed you on and they got you there. Everything about the day was superb, most particularly the organisation – absolutely crucial if a marathon is going to be remotely enjoyable. In any endurance sport, you push yourself to the limit. You can do so only when you have total confidence in the organisation underpinning it all. 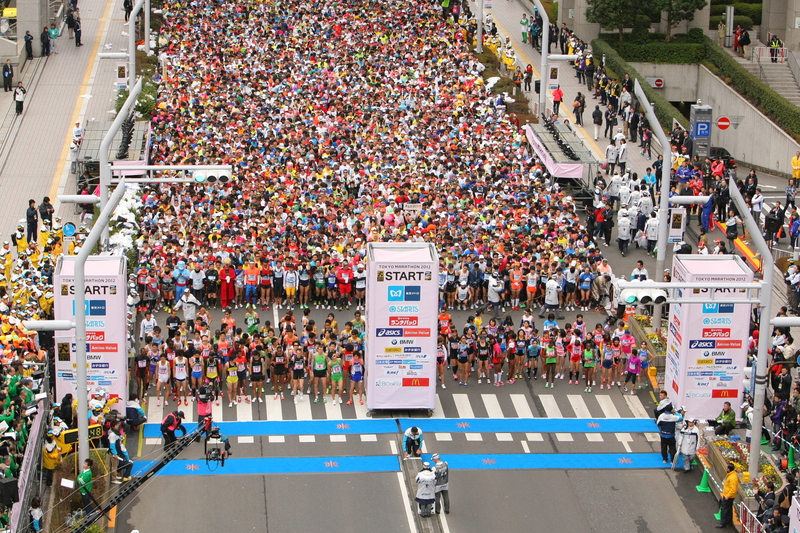 It takes a special skill and a huge amount of planning to get 36,000 runners underway without mishap; Tokyo, a young marathon in only its sixth year, rose to that challenge admirably. I didn’t do a great time, but I had a great time. 3 hours 46 minutes is 26 minutes off my best, but as a marathon experience, Tokyo was right up there with the very best, comfortably rivalling New York. The Tokyo Marathon Foundation’s dearest wish is that the race one day might nestle alongside the world marathon majors (New York, London, Berlin etc), and there is every reason to believe that it will do so before too much longer. Any marathon runners out there should seriously consider Tokyo next year for the complete marathon experience. It is exotic, constantly exhilarating and a total thrill. But it is also brilliantly organised. Marathon-runners need to be able to trust in the event they are running in, and from the moment you register for this one, you sense that you are in the very best hands. 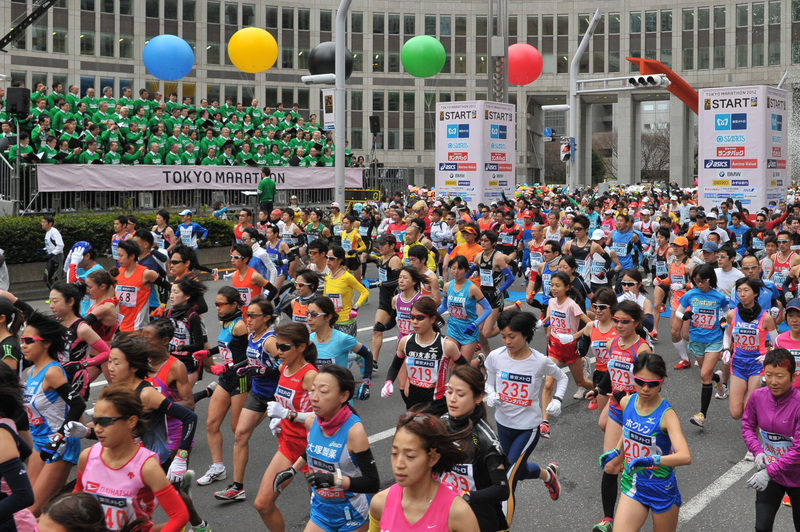 Tokyo is a newish marathon, but for organisation, it is streets ahead of some of its vastly more established European counterparts. 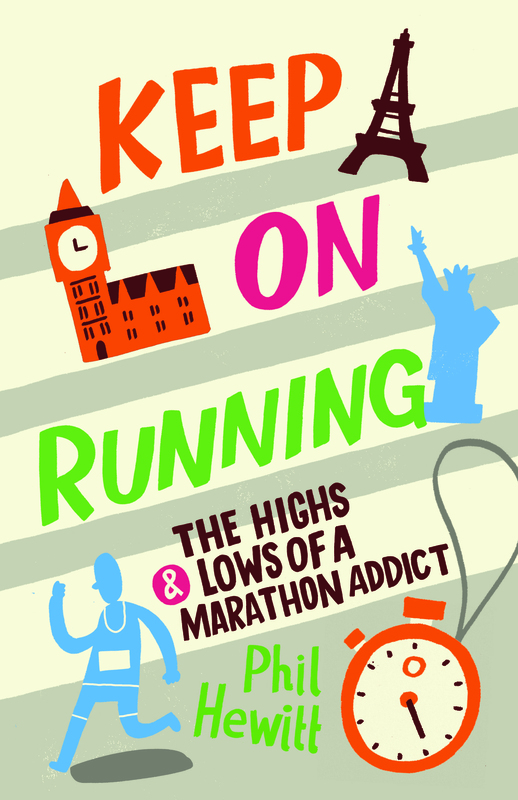 Marathons really do give you the most incredible highs, as I explain in my new book Keep On Running, which will be published by Summersdale on April 2. Tokyo takes those highs to levels I’ve never experienced before. The fascination of the very best marathons is the way that they reflect their city. Tokyo’s is at the top of the tree in that respect. You start off amid Tokyo’s skyscrapers and then run through the wonderfully-colourful, neon-lit night club district before skirting the Imperial Palace, so rich in history. You then pass by a gorgeous shrine and Tokyo’s very own version of the Eiffel Tower before heading off into the high-end shopping district where all the world’s major labels sit side by side for my very favourite kind of shopping – the kind where you zoom past without stopping. After that it is into the ancient heart of the city for a glimpse of the Gate Of Thunder which leads on into the city’s most historic areas. After that you cross a succession of thigh-busting bridges before approaching the finish. But alongside all those great permanent features, you’ve also got the sheer spirit of the day, traditional Japanese dancers, Japanese choirs, Japanese drummers, Japanese brass bands, Japanese children’s bands, all lining the route. It’s like running through a culture and history lesson unfurling before your eyes to give you a glorious insight into this vibrant, confident and above all likeable country. It’s nearly a year now since the tsunami and earthquake hit Japan. 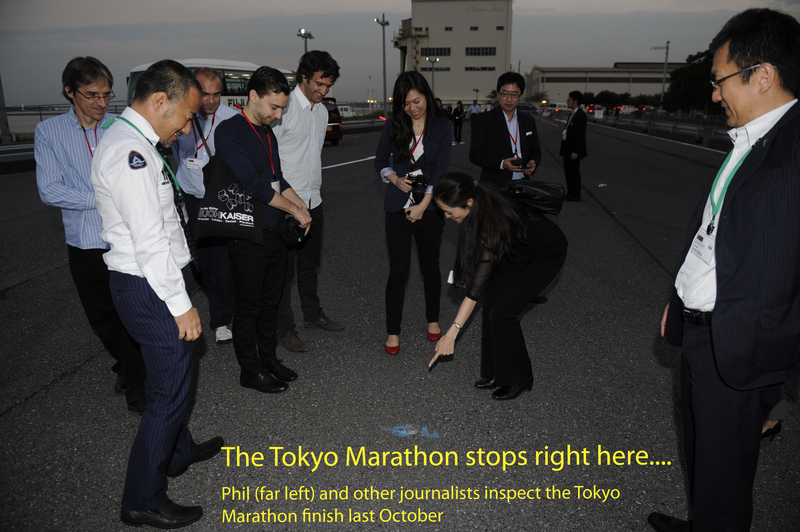 I was running as part of a select band of journalists from around the world, invited to Tokyo to experience at first hand that Tokyo is up and running again and back on its feet – as indeed were we. But whereas my feet now ache like hell, Tokyo’s are ready to run forever. Marathon-running is one of life’s great privileges and pleasures. But today I feel humbled and honoured to have been part of the Tokyo Marathon, a wonderful event in a truly-wonderful country. The great thing is that it is a marathon on the up, one which is confident and strong, but one which is clearly going to be even more so as the years go by. There is huge enthusiasm for running in Japan, and that enthusiasm is the driving force behind the marathon itself, ensuring that we all had not just a great day, but also a safe day. The organisers are desperate to see the marathon’s profile soar, and there is every reason to believe that it will do. The marathon is increasing its number of charity runners, adding an important new element to the day. It is also increasing its number of international runners, a factor which will increasingly put it on the world marathon map. I’ve now run marathons in nine different countries and in five different capitals; Tokyo is one to cherish. There are plenty of marathons that get lots of things right; very, very few that get absolutely everything right. Take a bow, Tokyo. I am sitting here going gooey-eyed at the thought of all those thousands of sweet little kiddies holding out all sorts of delicacies along the way, and towards the end I ate my fill as tiredness and the cold took their toll on me. But the strange thing was that those gorgeously-smiling children reacted as if you were doing them a favour by choosing their delicacy to grab. Quite the contrary. It was Tokyo which did its runners a great favour last Sunday – and I will relive forever the moment that my Tokyo Marathon medal was placed around my neck. Moments don’t come sweeter than that. Wish me luck in Tokyo this Sunday! Possibly my favourite marathon moment came in my second London Marathon, a mile from a finish which seemed never to get any closer. I was at my lowest ebb; every step was agony; confusion had long since squeezed out whatever common sense I had left. Maybe I had got the hydration wrong; maybe it just wasn’t my day. But something was seriously up, and I knew I had to get help from somewhere. Or someone. And that’s the glory of the London Marathon. There are plenty of people to choose from, hundreds of thousands of them lining the route that takes you to the finish. My good fortune is that I chose exactly the right person, a little angel of a lad, resplendent in his St John Ambulance uniform, standing on the corner as you turn into Parliament Square. By now I was in last-resort territory. That resort was to thrust my chest towards randomly-selected bystanders in the hope that they would shout out the name emblazoned across my chest. And, boy, did I pick the right boy in that ghastly moment. OK, a little tear still comes to my eye when I think about it ten years later. It was the most absurd thing to say. Completely bonkers. But it was also absolutely the right thing to say. I smiled, I laughed and I floated. New energy in my aching limbs, I made it through that final mile and was still grinning as I crossed the line. I was sickly blue in the lips, deathly pale in the face, but grinning from ear to ear. The actual winner had won an hour and a half earlier, but the little boy had been right. In my own terms, I could still win it and I did. Whenever (not often!) my love of marathons wobbles, I think back to that glorious moment – one which sums up not just the insanity of marathon running, but also its humanity; not just its horrible lows, but also its off-the-top-of-the-scale highs. That little boy will never know what he did for me that day, but ten years on, this Sunday morning as I stand on the start line at the Tokyo Marathon, I will be thinking of him, cherishing the memory of a moment right up there in the annals of my running history. And it’s that that makes Tokyo on Sunday so mouth-watering a prospect. It’s a place I fell in love with last October when I joined a group of journalists for a look at the course, courtesy of the Tokyo Marathon Foundation. 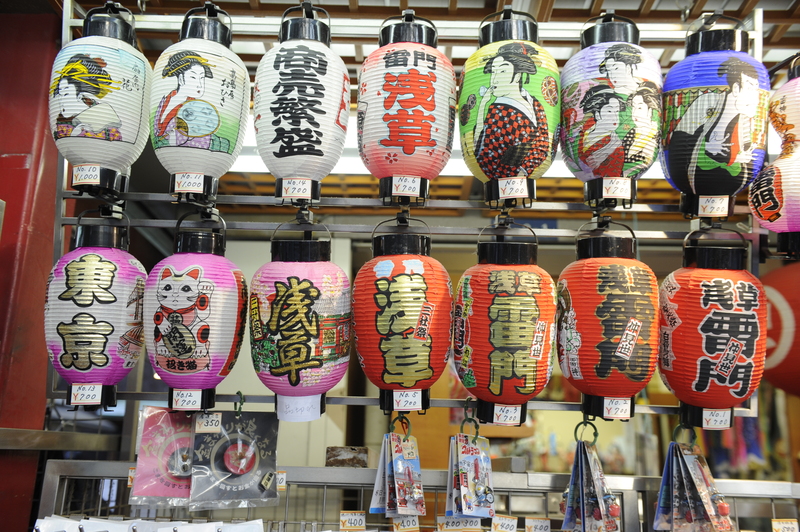 Japan is a country which hits you right between the eyes with the most vibrant, the most intoxicating mix of sights and sounds and smells. Tokyo is a place which grabs you and gets inside you, fast, fascinating and above all friendly – a city built on respect and on the warmest of welcomes. As guests of the Tokyo Marathon organisation, we were treated with every courtesy by hosts ever eager to please and confident in the knowledge that they have got a rare treasure to reveal: a city which makes you walk taller, lifts the spirits and leaves you drunk on its atmosphere. Everyone was intent on telling us that Tokyo was safe. I took them at their word, plunging down dark alleys and side streets camera in hand, exploring the bright glitzy neon streets and enjoying unmolested the beautiful tranquillity of an early-morning run. A self-confessed marathon bore and a veteran of 25 marathons in ten different countries, I like to think I know a good marathon course when I see one: Tokyo’s is a cracker, kicking off outside the Tokyo Metropolitan Government Building before heading off through the dazzling night club district. Then it reaches the perimeter of the Imperial Palace Gardens before heading for Ginza, Japan’s number-one high-end shopping district. 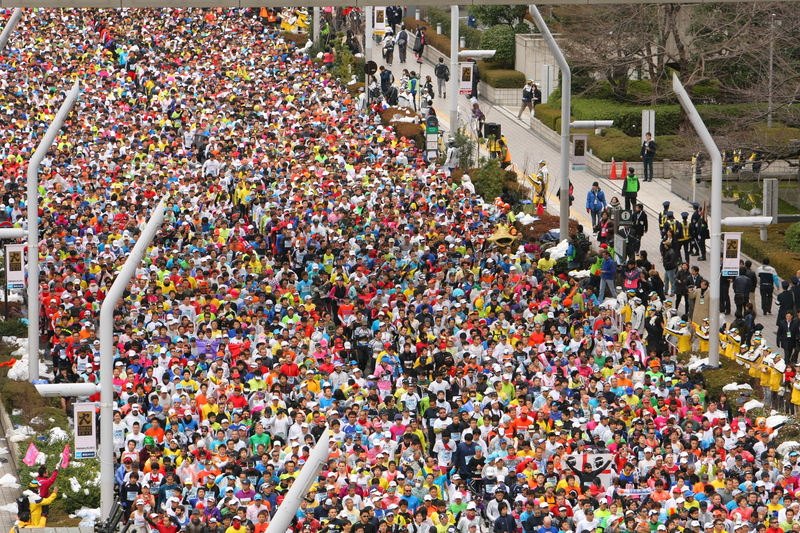 After that you plunge into the old town before wending your way to the finish at Tokyo Big Sight – a challenging course, but an excellent one, very much created with the sights in mind but also one geared towards the runners themselves, as its impressive 97 per cent finishing rate suggests. So, I beg of you, dear reader: be my little boy this weekend. The marathon starts at 9.10 on Sunday morning, which is ten past midnight UK time. Destination Tokyo for the most inviting of courses! The most important thing about a marathon? Why, it’s the course, of course. The distance will never differ. A marathon will always be 26.2 miles or 26 miles 385 yards or 42 kilometres 195 metres. However you want to express it, it amounts to the same. But the one great variable (well, aside from your present state of fitness) is the route that it takes you on, and here you get the great gulf. Some marathons are absolute stinkers, some are somewhere in between, some are 26.2 miles of bliss. My 26th marathon will be the Tokyo Marathon on February 26, and I confidently expect it to be very firmly in that last, much cherished category. My marathon low points have included Amsterdam and Dublin, both races which get you off to a reasonably enjoyable start and get you over the line with a tolerable sense of occasion. But in between – and much more so in Dublin than Amsterdam – you get 24 miles of tedium. Berlin wasn’t that much better in that respect. Dublin was a day of torrential rain, which didn’t help. The cascading torrents reduced everything to an eye-stinging blur as you passed through endless nondescript suburbia. In Amsterdam, they showed us a few canals and allowed us five or six miles of riverside running. Otherwise, it was deeply-dull industrial estates, dual carriageways and roundabouts. Berlin was simply big city, vast, sprawling and successive boulevards indistinguishable from the last. Against that, you have the spine-tingling highs – New York and Paris. Paris is similarly generous with its sights – a start and an end at the Arc de Triomphe, an opening stretch along the Rue de Rivoli, a gorgeous five or six miles of forest-running in the Bois de Vincennes and a second half which keeps you close to the Seine for much of it. The value of a decent course simply cannot be overstated: you need something to lift your soul when the body starts to flag. Stimulate the senses and you push further and further back the moment that tiredness truly starts to kick in. And that’s why I can hardly wait to get on that start line in Tokyo. Last October, as part of a group of international journalists, I visited the course on a trip organised by the Tokyo Marathon Foundation with the aim of promoting the event worldwide. My huge good fortune, just before Christmas, was to be invited back to run it. You never want to run a marathon without knowing just a little bit about the course. 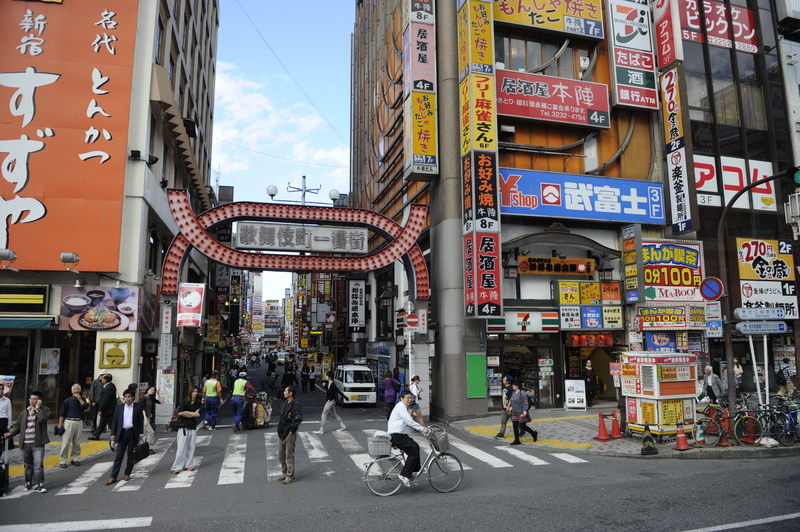 As I stand at the start in Tokyo, I will have it fresh in mind – a mouth-watering route which kicks off outside the Tokyo Metropolitan Government Building before snaking through the hugely-colourful night club district (and no, at nine in the morning, I won’t be stopping off). Along the way, it also skirts the Imperial Palace and passes through Tokyo’s high-end shopping district before going deep into the heart of ancient Tokyo before a lovely-looking finish at the massive exhibition centre. Usually, I run to thudding rock rhythms on my MP3 player. There won’t be any need to in Japan. All along the route there will bands and musicians and dancers adding terrific colour and occasion to the proceedings, precisely the kind of boost tired runners need more and more of as they head towards the finish. Nearly a year after the devastating tsunami, Tokyo is going to be pulling out all the stops to show us just what a vibrant, exciting, indeed thrilling place it is. Few things make me emotional. Marathons most certainly do.